Long before distance ace James Kegley embarked on his impressive string of accolades at Indiana University, Chris Greene Lake, and on the marathon circuit, it was another Kegley, working behind the scenes, who made it all possible. The permanent wooden pylons at Chris Greene Lake were originally placed in 1969 at the prompting of his father, Jack Kegley. He wanted to secure more swimming options for James, who at age 11 was a budding AAU distance star with limited pool options in the Charlottesville area (Mr. Kegley even built a pool with a lap lane in the basement of the family’s home a few years later). 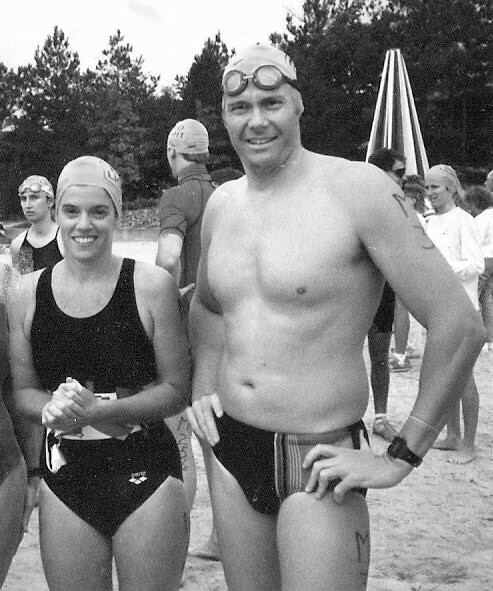 In 1971, two other devoted swimming parents, Sue and Neil Shepherd, organized the first official race at Chris Greene Lake so their son David could participate in a distance event. Sue was the Virginia AAU Long Distance Chair, and she and Neil directed the race from 1971 to 1980 for age-groupers. On July 10, 1977, a heat for Masters was added to the race (16 swimmers), and directed by Dale Petranach of Potomac Valley. The National Long Distance Swimming Championship (including a masters’ 2-mile cable) was held two weeks later on July 23 in Trout Lake, Manomonee Falls, Wisconsin. Results from both races were published in the September 1977 issue of Swim-Masters. A couple years later, United States Swimming (USS) broke away from AAU, USMS was formed, and Masters swimming in Virginia began to exist on its own as a separate entity. The 1980 Chris Greene race was an on-again, off-again affair, but at the last minute a masters national championship was conducted, with 21 people showing up to compete. Mike Stott won his age group that year in 54:56. Dale Petranach approached VMST about taking over responsibility for the event, and VMST President Forrest Sulllivan asked Mike to take over as race director the following year. Mike directed the race for five years (1981-85), and also participated in the race every year from 1979-2000. Under Mike’s leadership, interest in the unique event grew, and with help from Jim Miller, VMST hosted its first national championship in 1985. Jim got help from Betsy Durrant and many other dedicated volunteers in the ensuing years, and participation continued to rise. There were 171 participants by 1990, and the race had established a solid reputation as one of the premiere cable swims in the country. Linda McCowan took over as race director in 1991 and directed three national championships (1993, 1994, and 1996) with help from Abbie McGee. Joyce Mullins, Patty Powis, and Beth Waters followed and collectively oversaw four national championships (1997, 1999, 2000, and 2002) during their tenure. Dave Holland has directed the race since 2005, and with assistance from a spirited team of volunteers, VMST was chosen to host the national championship in 2006 and again in 2008. Over the years there have been many memorable swims. University of Virginia swimming coach Mark Bernardino won the 1981 and 1982 swims, and his course record of 43:51.69 stood until 1984, when Deborah Cain won the race with a 42:10.30. Cain, a former All-American at Rutgers, was the first and only female to win the event twice (1983-84), and her winning time from 1984 was un-touched as the women’s course record until 1997. That year, Katrina Poplawski finished second behind Kegley, recording a 41:29.09. Poplawski has been the women’s champion a remarkable seven times, including five straight from 1994-1998. In 2002, Deborah Reed, age 32, swam an impressive 41:05.48 to break Poplawski’s record, becoming only the second female to ever win the overall race. Most recently, distance phenom Abby Nunn won four consecutive 2-mile crowns(2009-12), with her 2010 effort of 40:07 becoming the female course record. Another woman of resilience, Shirley Loftus-Charley, has done the race every year since 1982, winning her age group more than 20 times, with 9 of those coming as national titles. On the men’s side, Kegley’s gold standard of 38:32 from 1988 withstood several challenges but finally was eclipsed by UVA’s Bradley Phillips in 2013 (38:25). In 1999, two other UVA distance swimmers, Austin Ramirez and Michael Fuller, also broke 39 minutes. Ramirez finished in 38:34, a mere two seconds behind Kegley’s historic standard, and Fuller was close behind in 38:53. David Alleva, a 1986 Indiana graduate, and Chris LaBianco, are the only other swimmers in the sub-40 minute club. Alleva won the 1989 race in 39:59, while LaBianco won the 2010 race with a 39:59.99. In 2015, the annual event was named the John Shrum Memorial Swim in honor of long-time local open water advocate John Shrum, who passed away that year. John had been a participant in the cable swims at Chris Greene Lake for decades.